Intergovernmental agreements are an important instrument in federal systems, establishing new social programs, regulating agricultural practices, and even changing constitutions. Despite their importance, there have only been limited attempts to understand agreements in a comparative context or to provide a theoretical framework for their study. 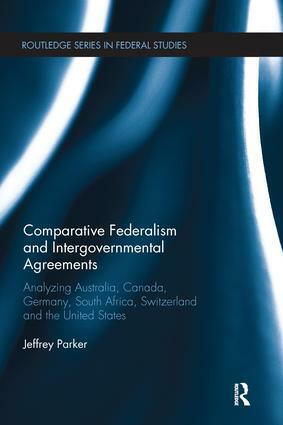 This book addresses both of these deficiencies by comparing the use of agreements in six federations (Australia, Canada, Germany, South Africa, Switzerland and the United States) and considering why certain federations form more agreements than others. Parker analyzes the data using an institutional framework that considers the effects of seven variables, including the constitutional division of powers, the system of intergovernmental transfers, the size of the welfare state and the nature of governing institutions. In addition, the study provides the first ever comparative database of national intergovernmental agreements — a new resource for future research. This book will be of interest to students and scholars of Political Science, Federalism, Government, Political Institutions, Political Theory and Comparative Politics. Jeffrey Parker received his Ph.D. in Political Science from the University of Western Ontario, Canada.